to create a beautiful display for Christmas cards. I love that this one looks like an inspiration board, especially since most of us could use a little inspiration at the end of what has been a difficult year for so many people. My friend and I were just discussing the fact that we have received far fewer Christmas cards this year. Perhaps people are trying to "go green" or maybe they just want to save on postage. Did you send out cards this year? You're right - it's hard to hang up an e-card. Send me your address and I'll send you a real card by snail mail. Really. And I extend this offer to any of you card deprived bloggers out there. I did! I love greeting cards and stationery. Domino is a constant font of inspiriation. I like how they can turn something simple or even mundane into something fabulous. As a mother, my mind doesn't work as quickly as it used to. Nudges from blogs (hint, hint) and magazines are a great help. It does seem like people have held back on holiday cards this year. Economy? Going green? Who knows? We sent ours out this past week-which is actually early for us-so we feel pretty good about it. I am stressing because I need to get mine out!!! I have recieved more cards than ever this year since getting married in October - What a great idea for displaying them! Love this idea as well -- such a beautiful way to display cards. Eeesh I haven't done them yet. I might just skip them & do Valentines instead. I've always been the one who sends them out. I write real notes, send them ahead of time and always choose gorgeous, proud, bold card designs. But...alas, a 9 month old is a bigger priority this year. I sent out not one card. Too busy keeping everything else going. I sent a few to friends but my mom sends out cards every year. We usually get a TON but they've been coming in slower than usual this year. I love getting cards! 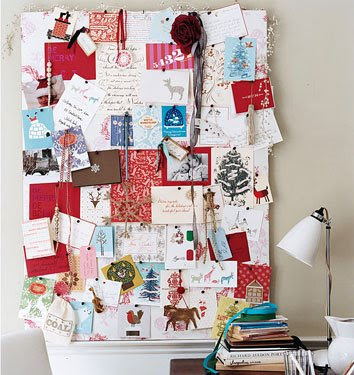 What a beautiful way to display Christmas cards! I sent them this out this year but I agree, it seems like as a whole everyone backed off a little bit.